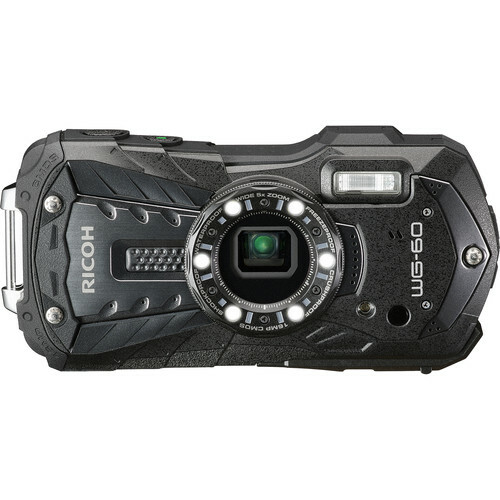 Built with toughness in mind, the black Ricoh WG-60 is a durable, compact point-and-shoot suitable for use in both extreme and everyday adventures. Its rugged physical construction renders it waterproof for depths up to 45.9' and shockproof from heights of 5.2', as well as freeze, crush, and dustproof. In regard to imaging capabilities, the WG-60 features a 16MP 1/2.3" CMOS sensor, which enables high-resolution stills shooting and Full HD 1080p video recording, as well as a sensitivity range from ISO 125-6400 to suit working in a variety of situations. A 5x optical zoom lens also contributes to this flexibility, which covers a wide-angle to telephoto 28-140mm equivalent focal length range, and is complemented by Pixel Track and Digital SR to help realize sharper imagery when shooting handheld. Additionally, the WG-60 also incorporates a 2.7" 230k-dot LCD monitor, which uses an Outdoor View Setting mode for improved visibility in bright lighting conditions, and six LED lights also surround the lens to help illuminate close-up subjects for macro shooting. Featuring a 16MP 1/2.3" CMOS sensor, the WG-60 is capable of recording high-resolution stills and Full HD 1080p video. The sensor also affords a sensitivity range of ISO 125-6400, for working in a variety of lighting conditions. Spanning wide-angle to telephoto focal lengths, the 5x optical zoom lens covers a 28-140mm equivalent range to suit photographing a wide array of subject types. Its optical design features five aspherical elements for notable sharpness with controlled distortion, and Pixel Track SR (Shake Reduction) and Digital SR both help to minimize the appearance of camera shake when shooting handheld. Six LED macro lights surround the lens to produce brighter, more even lighting when working with close-up subjects. Enhanced Digital Microscope mode enables close focusing to 0.4". Benefitting working with the rear 2.7" 230k-dot LCD monitor, an Outdoor View Setting mode automatically boosts the screen's brightness when working in bright, sunlit conditions for greater visibility. Included D-LI92 rechargeable lithium-ion battery provides approximately 300 shots per charge. A nine-point autofocus system provides quick and accurate focusing performance and is also capable of detecting subject's faces using Smile Capture, Blink Detection, Self Portrait Assist, Self Portrait Assist + Smile Capture, and Pet Detection settings. Interval shooting modes allow you to record a series of exposures at pre-determined intervals for producing time-lapse imagery. Digital Filter: B&W/Sepia, Toy Camera, Retro, Color, Extract Color, Color Emphasis, High Contrast, Starburst, Soft, Fish-eye, Brightness, and Miniature Filter. Box Dimensions (LxWxH) 7.6 x 5.6 x 3.3"
After using it in salt water, do you just rinse it off under a tap? Is that adequate? Can this camera connect to iPhone wirelessly?